(1, 2, 3, 4), (1, 2, 4, 3), (1, 3, 2, 4), (1, 3, 4, 2), (1, 4, 2, 3), (1, 4, 3, 2). How many paths are there on the new grid? (Each path must start at 1, and by moving to adjacent squares visit every square in the grid exactly once). And how many paths are there on a 2×20 grid? When ordering a pizza from the Enigmatic Pizza Company you can specify the toppings on your pizza. 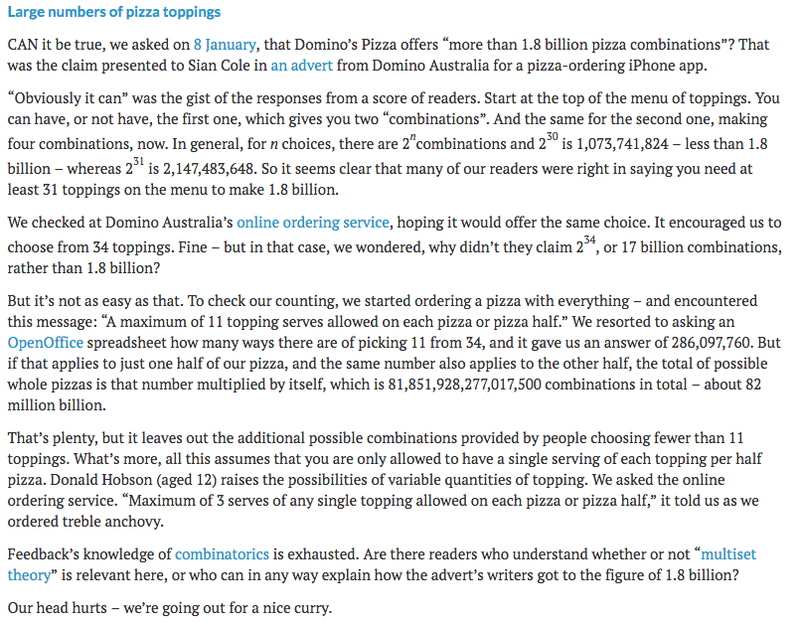 There are 34 possible toppings to choose from, and you can have up to 11 toppings on your pizza. But you can have no more than three helpings of any individual topping. The most basic pizza available would be one with no toppings at all. And a fully loaded veggie pizza might have 3 helpings of cherry tomatoes, 3 helpings of mixed peppers, 3 helpings of jalapeño peppers and 2 helpings of mozzarella cheese, using up all 11 toppings. What is the total number of different pizza combinations that are available? This puzzle has been getting a lot of attention recently, for example on the Guardian and BBC websites. It is quite similar to some of the Enigma puzzles published here. Albert and Bernard have just become friends with Cheryl, and they want to know when her birthday is. August 14, August 15, August 17. Cheryl then says she is going to tell the month of her birthday to Albert (but not to Bernard), and the day of her birthday to Bernard (but not to Albert). She does this. Albert: I don’t know when Cheryl’s birthday is, but I know that Bernard does not know either. Bernard: I didn’t know when Cheryl’s birthday is, but now I do. So, assuming they are all telling the truth and are all perfect logicians and have no further information, when is Cheryl’s birthday.